"Reformed theology" can be scary words that conjure up images of Latin phrases, impractical controversies, and the need for a PhD. 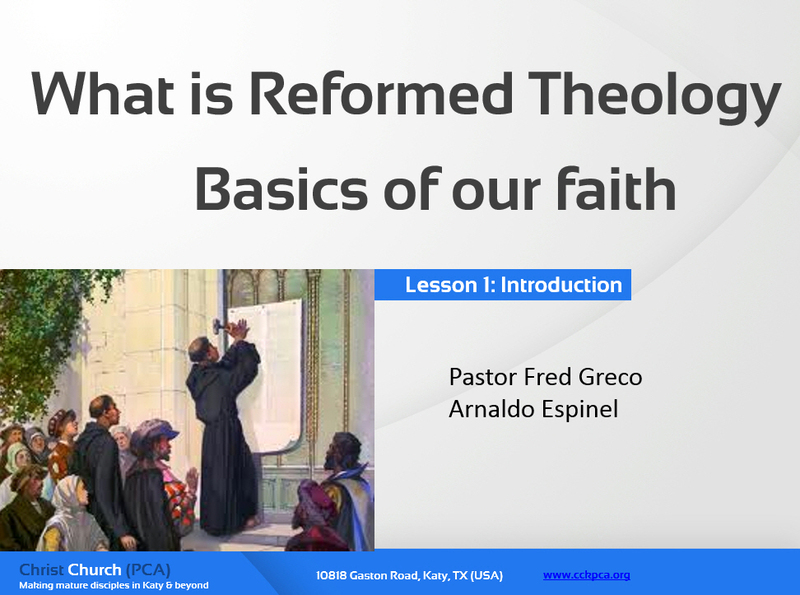 But in reality, theology is simply the organized study of what the Bible teaches, and being Reformed means that we are committed to the Scriptures above all. In this class, we will see what Scripture says about God, the Bible, Jesus, salvation, baptism, and the Church. The resources from this class are not intended to be an in-depth look at any particular subject, but rather a sweeping overview of the great truths of the Bible and how they are organized. It is looking to understand the forest, not the leaves on a particular tree. In the end, we will see that the Lord God is sovereign over His creation, His people, and His salvation: "He who is the blessed and only Sovereign, the King of kings and Lord of lords, who alone has immortality, who dwells in unapproachable light, whom no one has ever seen or can see. To him be honor and eternal dominion. Amen." (1 Timothy 6:15-16).